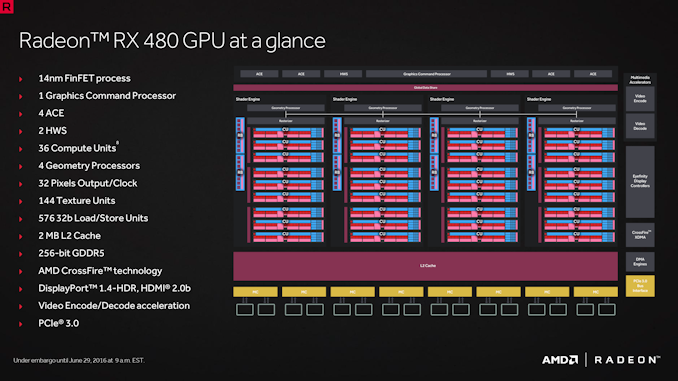 When AMD launched the Polaris-based Radeon RX 480 in June 2016, the focus was firmly on the mainstream market, looking to offer superior value over raw performance. 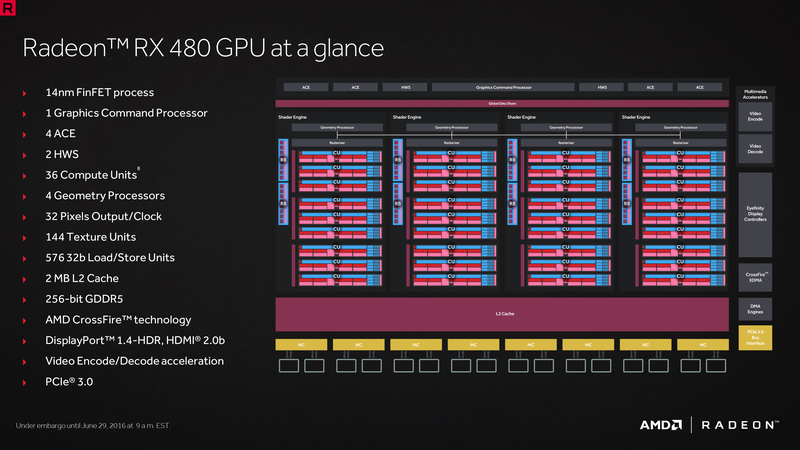 At the same time, AMD also sought to improve their power efficiency by leveraging both microarchitectural changes and their first generation of FinFET GPUs. Ultimately, this straightforward approach was somewhat derailed by the recent cryptocurrency mining craze, but Polaris has carried on, with bits and pieces appearing in consoles (Xbox One X and PS4 Pro) as well as an early 2017 refresh in the form of the RX 500 series. Launching today is the latest entry with new top offering in the RX 500 series: the AMD Radeon RX 590. 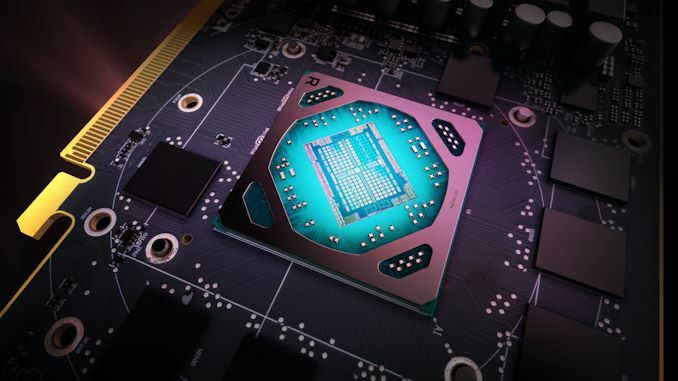 In short, the RX 590 is another Polaris 10 revision but now built on GlobalFoundries' 12nm process, enabling higher clockspeeds on an increased power budget. In that sense, it is much like the RX 580 refresh and its increased clocks over the RX 480, achieved by spending all the efficiency gains from manufacturing maturity – and then some, given the additional 35W TBP increase. The RX 590 ups the ante with a 225W TBP, 75W over the original RX 480 TBP, and hits RX Vega level clockspeeds with reference 1469MHz/1545MHz clocks. Naturally, the tradeoffs between power efficiency and raw performance is a classic problem of silicon engineering, and it’s been somewhat of a sticking point for Polaris since the beginning. Even though Polaris improved on efficiency over older GCN products, NVIDIA’s top-to-bottom Pascal series brought its own power and clockspeed improvements. At the original RX 400 series launch, pushing the 150W power budget to its limits led to the single 6pin powered reference RX 480’s issues with power draw from the PCIe slot. 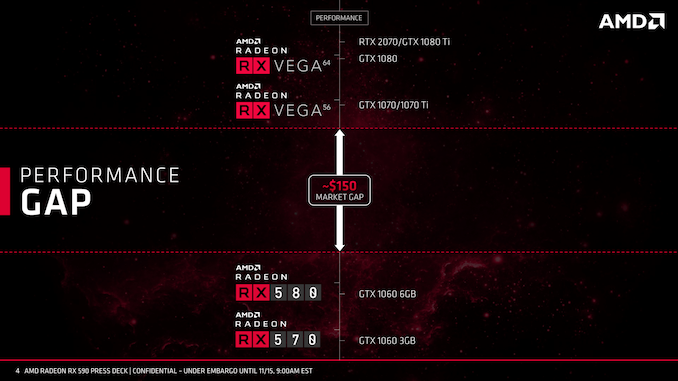 So as we noted at the RX 500 launch, instead of fighting an efficiency battle that they can’t win, AMD has opted for raw performance and competing on value. Otherwise, there aren’t any other architectural changes, and memory bandwidth is unchanged. We’ve already seen that Polaris 10 likes memory bandwidth, but realistically the volume and timing of these RX 590 parts are unlikely to warrant the cost or validation of alternatives (i.e. 9 Gbps GDDR5), especially considering the recent memory supply crunch. As for the 12nm process itself, AMD isn’t disclosing much, but given development costs it’s likely a straight port of the 14nm design with 9T transistor libraries, much like Zen+. With an identical die size and transistor count to Polaris 10, the silicon layout is presumably like Zen+ as discussed by Ian earlier this year; additional dark silicon that can now act as a thermal buffer between features. Or in other words, lowering potential thermal limitations to enable higher clocks, something that's no easy feat given that Polaris wasn't originally designed to clock quite this high. On that note, GlobalFoundries’ 12LP has been available for most of last year, and we’ve already seen it in action with Ryzen 2000 and Threadripper 2. 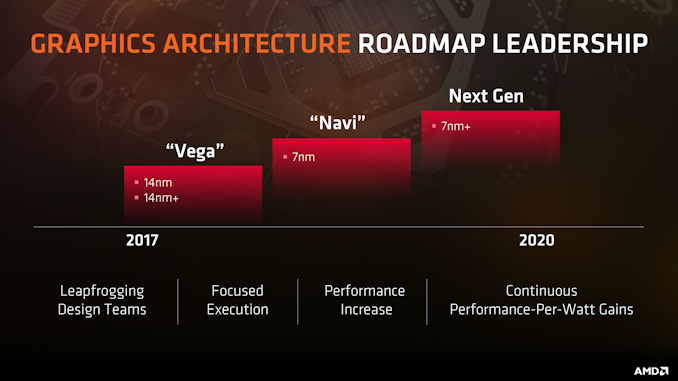 And “Vega 14nm+” was indeed listed on AMD’s roadmap in mid-2017 though no longer present by the time of CES 2018. So why is AMD doing this now, on the cusp of 2019? AMD’s line is that given limited capacity and time-to-market considerations, this was the timeframe for the RX 590 to happen. Unpacking this a little bit, when we take capacity at face value, the Ryzen 2000 family (which includes Raven Ridge) is considerably higher volume compared to one graphics SKU and carries much more market impact, which factors into resources for both fabbing and productizing the RX 590. In any case, being pin-compatible with Polaris 10, Polaris 30 allows board partners to quickly integrate the GPU into existing high-end RX 580 board designs. Meanwhile the story behind Vega 12nm (as with other Vega details) is known only to AMD and out-of-scope here, but roughly speaking the obstacles facing RX 590 development would be multiplied with Vega. We also know the impact of decreasing cryptocurrency mining demand and potential channel congestion, but also of the AIB dynamics that AMD need to consider with GPUs. Seasonally, the first half of the year is flat to down for GPU sales, and today’s launch of course is just in time for the Black Friday and holiday window (though AMD has probably missed most of the OEM window). Not to be forgotten is their erstwhile competitor NVIDIA and the new generation of high-end GeForce RTX cards; hardware launches tend to be best met with some kind of hardware response, even on solely marketing grounds as in this case the RTX 2070 and above compete in a different segment than the RX 590. 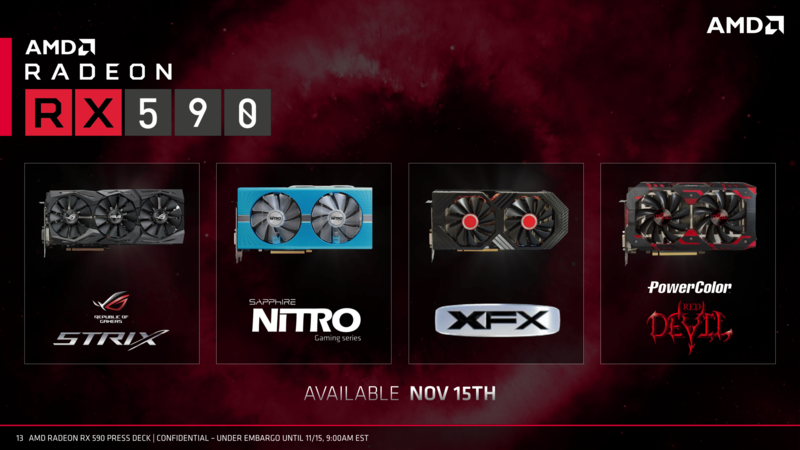 Like the RX 580, AMD is not shipping a reference design for the RX 590, and four custom models (XFX, PowerColor, Sapphire, and Asus) are available today. At a glance, the AIB cards appear to reuse boards found in factory-overclocked RX 580s, which is expected given the drop-in compatibility of Polaris 30. Meaning, for overbuilt boards that already meet the RX 590 power requirements, then partners can simply put in a Polaris 30 GPU and flash the RX 590 BIOS. Realistically, heavily factory-overclocked RX 580s are not too far off from RX 590's clocks, with boards and thermal solutions built for higher TBPs anyway. For example, the XFX RX 590 Fatboy and PowerColor RX 590 Red Devil are not far from the XFX RX 580 GTS Black Edition OC+ and PowerColor RX 580 Red Devil Golden Sample, both with 1425MHz boost. To sweeten the deal, AMD is including a launch bundle of three games: Resident Evil 2 (2019), The Division 2, and Devil May Cry 5. Officially, it's called the "Raise the Game Fully Loaded" bundle and brings all three games for qualified RX Vega and RX 590 purchases, and any two of the three for qualified RX 580 purchases. The offer runs until February 9, 2019. 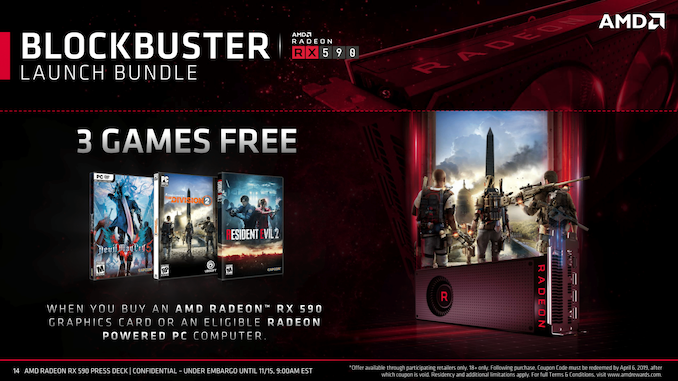 In any case, the original three-game “Raise The Game” bundle for RX Vega, RX 580, and RX 570 concluded at the start of the month, so AMD has no other competing promotions on their side. NVIDIA, however, still has their Monster Hunter: World bundle for the GTX 1070 Ti, GTX 1070, and GTX 1060 6GB running until November 29th. And on the topic of the Pascal-based 1280 core GeForce GTX 1060 6GB, it remains the primary competition for the RX 590. Since its July 2016 launch, the GTX 1060 6GB has been squaring up against Polaris since July 2016, with a mild 2017 refresh in the form of 9Gbps GDDR5 variants. The GeForce RTX 20 series has not offered a direct successor for the GTX 1060 6GB or below, so there’s a potential opening for a modern card in that price/performance space. But AMD is clear in targeting the performance gap between the RX Vega 56 and RX 580 8GB. Nevertheless, the RX 590 is an iterative product and much like the RX 580 is not intended for current Polaris 10 owners. So AMD is largely trying to court those gaming at 1080p on older mainstream cards like the GTX 970 and R9 380. Or in other words, those due for an upgrade and looking at the $200 to $400 video card market. At an MSRP of $279, the RX 590 is certainly differentiated by price from the RX 580 8GB, which can currently be found for around $200-$210. Meanwhile the GTX 1060 6GB is around $250 at the time of writing. As the third iteration of Polaris 10, the RX 590 will need to ensure a solid lead over both, especially if power consumption hits the roof. We’ll soon find out.